What is a Zero-Drift Amplifier? A Zero-Drift Amplifier has a very low offset voltage. Its drift is close to zero with respect to changing temperature and time. The benefit of a zero-drift amplifier is that it improves amplifier input offset voltage performance in the range of µV or lower. Due to its high performance voltage offset, zero-drift precision amplifiers are ideal for high precision signal conditioning circuits and applications. 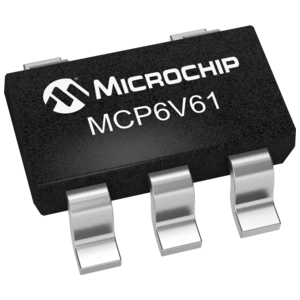 Microchip's zero-drift amplifiers use self-correcting architectures; i.e they are designed to continuously correct for input offset error. The design architectures of zero-drift amplifiers utilize auto-zeroing and chopper-stabilized technologies to continuously self-correct DC errors over time and temperature. This minimizes offset, offset drift and 1/f noise. In the process, other offset related characteristics such as common-mode and power supply rejection are also greatly improved. Since the offset error of the amplifier is corrected thousands of times each second, the offset drift over both time and temperature is greatly improved. A gradual and undesired change in the zero reading or indication of a meter or instrument. This is usually corrected via a zero adjustment. A complete absence of drift in a component, circuit, device, instrument, piece of equipment or system. What are some Zero-Drift Amplifier Applications? Because zero-drift amplifiers are designed for extremely low offset voltage, high precision, high resolution and high gain applications, they are well suited for applications such as temperature measurement, pressure sensing and other similar sensors that require a high level of sensitivity. What Zero-Drift Amplifiers does Microchip Technology Offer? Microchip Technology has developed two different self-correcting architectures: Auto-Zero topology and Chopper-Stabilized topology. Both of these architectures fall under the zero-drift designation.